Get ready, Bay Area. Opening Day for the San Francisco Giants is finally here. The Giants are in the desert to take on the Arizona Diamondbacks in a National League West division showdown. 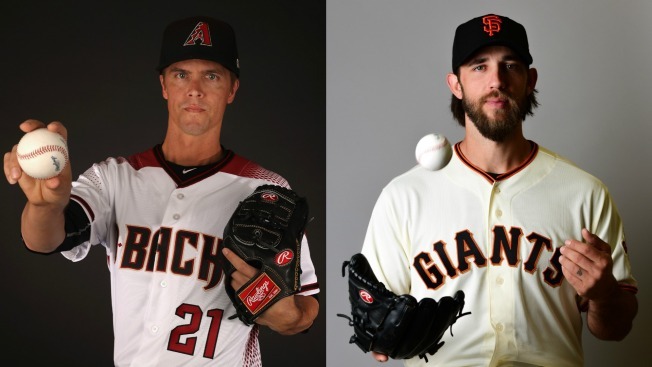 First pitch is slated for 1:10 p.m.
San Francisco's lefty stud Madison Bumgarner will take the hill against Arizona's ace Zack Greinke. Center fielder Denard Span will lead things off for the Giants, followed by first baseman Brandon Belt and right fielder Hunter Pence. Buster Posey, who will be in the squat, returns to his regular role as the cleanup hitter. Brandon Crawford, fresh off his Gold Glove from the 2016 campaign, will be flashing the leather at shortstop. Eduardo Nunez will play next door at third base and bat in the sixth position. Jarred Parker earns the start in left field. He will be followed in the batting order by second baseman Joe Panik in the eighth hole and Bumgarner in the ninth and final spot. Hoping for yet another round of "even-year magic" last season, the Giants' pursuit of a fourth title in six years was upended in the National League Divisional Series when the eventual World Series champion Chicago Cubs dispatched the Giants in four games. The Giants won't open up before their home crowd until April 10 when they host Arizona for a Monday afternoon matchup. That's when fans of the "Orange and Black" will be able enjoy to the crack of the bat, the aroma of ready-to-eat garlic fries and unimpeded views of the San Francisco Bay from AT&T Park. San Francisco leads Arizona 5-4 in the ninth inning. The Giants and Bumgarner were rolling after five innings — leading 3-0 — before Arizona heated up in the sixth. The Diamondbacks jumped on Bumgarner for three runs in their half of the frame to tie the game. Bumgarner responded with his second solo shot in the top of the seventh. Arizona, facing San Francisco's bullpen, answered with a run of its own in the eighth. San Francisco's Conor Gillaspie broke the tie in the ninth inning with a sacrifice fly, which scored Panik.